Dutch News Round Up : Are They Serious? It’s a fabulous Friday, the sun is shining, I’m in a frivolous mood and feeling flippant. And no, I haven’t been enjoying a liquid lunch. For a change I thought it might be fun to comment on a few snippets of this week’s Dutch news. I’m sorry but I think it’s hilarious. The Dutch government has been highly embarrassed this week by their 2012 spending plans being published online. It seems some smart person simply changed the date on last year’s budget website URL from 2010 to 2011 and discovered the budget waiting for publication. Duh. The person responsible has been described as ‘a hacker’. Come on. This was someone using their initiative who got lucky. The plans were only leaked a day earlier than intended, four days ahead of the opening of parliament and Queen’s speech. The idea being that MP’s would have time to prepare for the political debates on the finer points of the budget later next week. The Prime Minister, Mark Rutte, was reported as saying ‘ the leak is extremely irritating and unfortunate.’ I bet. It seems next year documents will not be available until the day parliament opens. Assuming someone thinks to block the 2012 budget website until publication. It seems the Poles are in trouble again. They’ve been fishing for carp and pike and not throwing them back. Perhaps, like me, they regard throwing the fish back as a bit of a waste of time. Seems they’ve been eating the fish. Who’d have thought it? And that the Poles are partial to carp and pike. It’s amazing what you learn. A spokesman for Sportsvisserij (the national fishing organisation) said ‘They have other (different?) ethics and culture.’ Obviously. They assume fish are to be eaten. As I did but I’m learning. Apparently extra wardens are being used by local fishing clubs and publishing information in Polish to encourage Polish fisherman to throw fish back. Good luck with that one. Today the Dutch cabinet will agree to ban the burka at their regular meeting. Women wearing one in public are to be fined €380. This follows bans in France and Belgium. What surprises me is that the normally tolerant-of-all things Dutch have an opinion and are taking a stand on this. Putting aside my own views it seems a huge statement for the government to make when it’s believed there less than 100 women in the country who actually wear a burka. Most Islamic women wear headscarves and very pretty they look too. Given the unpredictability of the Dutch weather it seems very sensible. Come to think of it, most of the women in head scarves probably aren’t muslim at all, just sensible huisvrouws. I’ve only ever seen one women here in a full burka and she was taking a short stroll outside the Iranian embassy residence and I’m pretty sure she’d have diplomatic immunity. Obviously a strong political move on the part of the government. Nothing at all to with the execution of a Dutch national in Iran back in January then?? Scanning through the doom and gloom of the (leaked) government budget, tucked away between the budget deficit, rising unemployment and tough times ahead for the nation was an item that caught my eye. €300,000 for a new Royal Family website. Come on guys, what joker thought this was a good idea? 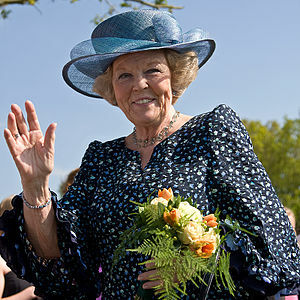 I can’t imagine Queen Beatrix will be impressed. Or did ‘the hacker’ just type it in for a bit of a giggle when he pressed the publish button? I’d like to think so. At least that would show a sense of humour and have nothing to do with insensitive government thinking. And was it also a joke that €300 billion has been set aside for the European emergency fund? Emergency fund? They’re obviously expecting one heck of an emergency. Apologies, my lighter mood has evaporated. Perhaps we’ll forget the news for now. For quite a while if the doom merchants are correct. Normal blogging will be resumed . . . This entry was posted in Dutch Culture, Dutch Laws, Taxes and Bureaucracy and tagged burka bans, dutch banning the burka, dutch politics, leaked dutch budget, mark rutte, poles eating fish stocks, Politics of Iran, Politics of the Netherlands. Bookmark the permalink. 4 Responses to Dutch News Round Up : Are They Serious? I’m happy to be an emergency if they will invest just a little skerrick in me.